One of the best ways for #EventProfs to increase attendance at your next event is to get other people to do your job for you. Assemble a group of people that are incentivized to make the event a success and set clear registration goals. There are many ways to incentivize a team of event influencers. Identify the right people to be your co-hosts and make sure they feel responsible and are held accountable for RSVPs or ticket sales. You adjust each co-host’s permission level to better control your team of influencers. 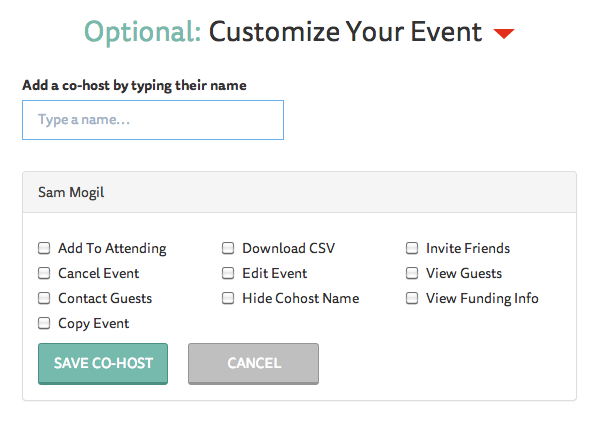 Add as many co-hosts to an event as you’d like with full control over what abilities each of your co-hosts have. You can give them permission to perform all, some, or none of the following functions: 1) add to attending, 2) cancel the event, 3) contact guests, 4) view guests, 5) download the guest list with full guest data, 6) edit event details, and 7) view funding info.